I hope that everyone has seen our announcement of this year's Theme Park Insider Award winners. We've been doing this for 17 years now, and while I've enjoyed this part of the Theme Park Insider experience, I also have decided it is time to make some changes in the way we handle the awards. The Theme Park Insider Awards are determined by the collective ratings submitted by readers for the rides, shows, restaurants, and hotels that we list on the website. The locations with the highest average rating and a minimum number of ratings win. For the "Best New..." awards, locations that open between July 1 and June 30 of the next year are eligible, since I announce the awards each year on July 4. My journalism background informed by decision to announce the awards on the Fourth of July. I knew that newspapers and TV stations were looking for relevant, holiday-themed stories to fill their newshole on what is almost always a glacially slow day for news. A feature on theme parks, which millions of people will visit across the country on the holiday, would fulfill that need... but what makes that story a better choice than focusing on the beach, or national parks, or any other popular holiday destination? So I decided to provide what we in the journalism business would call a "news peg" - an international awards competition honoring the world's best in the theme park business. And while that was a great strategy back when people actually paid attention to newspapers and TV stations, it's become pretty much irrelevant now, when attention for websites (such as ours) is driven more by social media than old-school media. 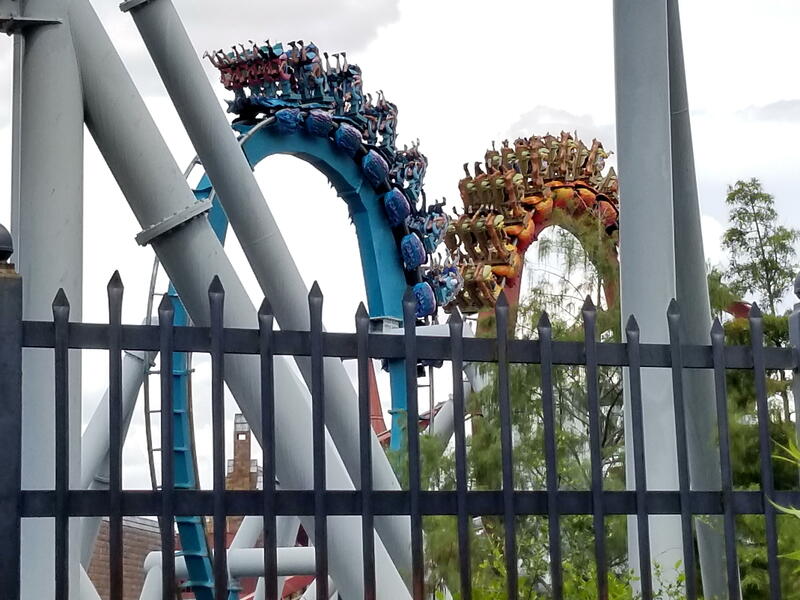 The mid-summer announcement also worked when parks has their acts together and got all their new rides opened by Memorial Day, giving readers a month of rating and reviewing before the eligibility window closed on June 30. But with more and more debuts sliding into June and July, or even later, the July 4 announcement has become awkward... as we see this year, when the Best New Dark Ride Award went to an attraction that opened the previous summer. It just makes more sense to make the eligibility period be the calendar year, which would necessitate moving the announcement of the awards to January. In addition, since the whole purpose of the awards was to draw attention to the site while signaling to potential readers what kinds of parks and attractions the current readers of the site valued most, I also think that I need to shift the focus of the awards from meeting a need of newspapers and TV stations toward fueling some more social media buzz. I like that we haven't reduced the awards to a straight ballot-stuffing popularity contest, a la USA Today's awards. Those types of contests always will be won by the parks that are willing to use their social media influence to drive their fans to vote. Disney and Universal won't do that, but Six Flags will. But I want our awards to reflect what this community values as the best of the best, instead of what a drive-by influx of one-time visitors voted for. That said, many Theme Park Insider readers have been frustrated by not being able to take a more active, direct role in the selection of the awards. Others don't understand how the ratings select the winners. So I am considering a new model for selecting the winners of next year's awards. I will use the collective reader ratings to select finalists in each of the categories, then put the finalists up for a popular vote to determine the winners. That allows us to have it both ways — to offer a limited selection of finalists that all have won the support of the community, but also to offer a vote that will inspire active participation by both existing and new members of the community. The votes would be open for a week in early January, with the announcement of the winners following. The next question is... do we announce awards next January, based on six months of eligibility for new attractions? Or do we wait until January 2020, and open an 18-month eligibility window? My hope is that these changes will revitalize the awards, help drive more attention and traffic to the Theme Park Insider community and give us something fun to do in January when not much tends to happen in the theme park business. Thoughts? Question, News outlets seem pretty desperate for copy the week between Christmas and New Years, why not that week? Could you not break down the best new attraction into 3 categories? Just trying to get that choice into the 2019 awards ?? Chad, it's not that news outlets are no longer needing copy this week, it's more that their readership and viewership has collapsed to the point where there is no significant promotional value to us in aiming the awards at them. We've always had the Best New Attraction Award, but in recent years we've supplemented that by adding other "Best New..." to complement the winner. So we'd have Best New Roller Coaster when the overall winner was a dark ride, and vice versa. But moving to a poll-based system for determining winners will force us to get more consistent with the categories. Might not do all of them. Might do others. I have between now and January to decide. Many times it's been mentioned that the Best Theme Park category should be split into two- best "Theme" and best "Amusement" park. HersheyPark is not a theme park. Disneyland is not an amusement park. They should not be expected to compete against each other any more than you would have a "best ice skater" competition between a figure skater and a hockey player. They are not the same kinds of park. Add "Best Amusement Park." I thought about the 'amusement' vrs 'theme' but what will be the dividing line between the two? I assume the 'attraction' category would include rides such as the Starflyer on I-drive and Cyborg at 6 Flags as 2 examples? And the dark ride ... maybe Haunted Mansion? Derren Brown? Space Mountain? Interesting list of categories for sure. Ideally, I would like to have eight to 12 categories whose names casual readers would understand instantly. Totally open to suggestions! I do not go to the ratings part on this site and My non journalism background thinks there needs to be a better way to determine the outcome. I do not go to the ratings forms since I am busy and do not have the time or desire to rate every damn attraction I like..
Also let’s try to keep politics out of the conversation on this site. Let’s do our best to get along with each other even when we disagree. I don’t vote because I don’t visit all the attractions despite knowing and visiting a lot more than the casual visitor. The second part of the awards would be in October to announce the best new attractions for each of the attraction categories. Lastly, I'd like to see the rating system on this site returned to the previous 10-point scale rather than only giving a choice between four ranking levels. I haven't voted for many attractions over the past year as I find the categories a bit too broad. The trouble with the 10-point scale was that most people were only using two of the points on the scale: 10 and 0. I thought that switching to fewer options might actually encourage people to diversify their votes, to create more precise ratings. I think moving to a calendar year award period is the way to go, but only the first of any cloned attraction should count towards a "Best New" award (i.e. only DL's Galaxy Edge attractions would be eligible if they are indeed identical to the ones opening in DHS). However, putting these up to a vote kinda eliminates the organic nature of these awards. I'd rather leave the voting to the annual March Madness tournament, or some other end of summer voting contest (perhaps for just new attractions). I always stay honest and only vote for things that I've experienced within the last year, but I'm not sure if others approach things the same way. For instance, I haven't been to California in 5 years, so I haven't provided any ratings for any of those parks since then. Same goes for other theme parks that I don't visit nearly as frequently. So, allowing the awards to be given based on straight voting may introduce reader opinions from years and years ago when attractions may have operated differently than they do today. I do think the awards should be given out to both US and International parks with an overall global winner. Being a US-based site, I think it's tough to gauge hundreds or thousands of ratings for US parks against a few dozen ratings for International parks. As exemplified by Yelp and other open rating systems, there are always going to be a few GREATEST THING SINCE SLICED BREAD, and WORST TIME EVER reviews that you're going to get in a large data set that might be absent from a smaller sample set. I also think that if TPI is awarding "Best New..." it should also award the "Best of" in each of those categories. For instance, if a "Best New Attraction" is being awarded, there should also be a "Best Attraction" award. I know the categories need to be flexible from year to year to keep up with the trends and changing landscape of the theme park industry, but there should always be a Best Dark Ride and Best Roller Coaster (maybe both wood and steel) every single year along with the Best Hotel, Best Restaurant and Best Park categories. I've long enforced a "no clone" rule in the Best New Attraction category, but Disney's overlays sometime test the definition that, don't they? Thanks again to everyone for the thoughtful comments! @ James Koehl - How do you figure that Hersheypark is not a theme park? What in fact is the definition of a theme park? Hershey is divided into specific sections and some of these have discernible themes. For instance, Storm Runner is located in the Pioneer Frontier section of the park as is Trailblazer and the latter certainly fits in with a pioneering theme. My mind works in simple ways ... if I pay one price to get in and ride anything for that same price, then it’s a theme park. If, like BPB, Fun Spot, for examples, I pay per ride then it’s an amusement park. You should have a category for "Best Roller Coaster Jim Koehl rode on June 25"
@Mako, I don't think that defnition works... Blackpool you can ether pay one price and ride almost everything, or pay for entry and then for each ride.... and although it might have a "Nickelodeon Land", I wouldn't by any stretch call it a "Theme Park", its an "Amusement Park" - the rides too crammed in for any actual cohesive theming. ^Bobbie, I haven't been to HersheyPark in years and don't remember it having themed lands. If they were always there, they didn't impress me. Cedar Point does indeed have themed lands (Frontier Town and Trail, Camp Snoopy, Planet Snoopy) but even I wouldn't consider it a "theme" park. Perhaps this is something we can discuss on your visit here (in between your History of Cedar Point highlights!). BTW, everybody just ignore Jeff Elliott's comments about me...he's just jealous that Cedar Point is a short drive from my house and that the entire site of Elitch Gardens would fit into Steel Vengeance's footprint without its on-ride photo booth. Chad/Jeff .... it's never going to be that easy is it :) Most probably there never will be a one defining reason to call a park theme or amusement, but for sure I'd never call Fun Spot or BPB a theme park ! .... but I would call Cedar Point a theme park for the reasons James mentions re. themed areas. Fun topic, and we can all agree to disagree on this like we do on what's the #1 coaster on the planet ! !